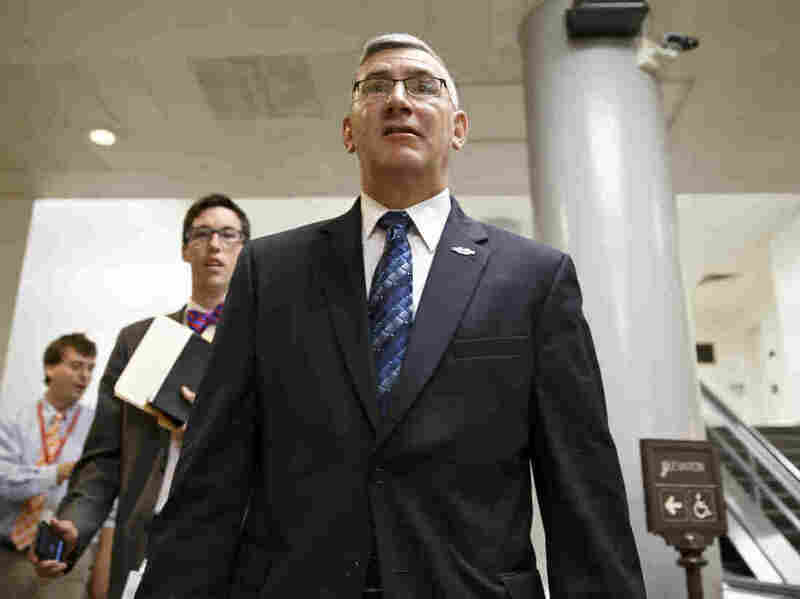 Embattled Montana Senator Withdraws From Race : It's All Politics In the wake of plagiarism accusations, appointed Democratic Sen. John Walsh announced Thursday he would not seek a full term in November. Sen. John Walsh, D-Mont., has been accused of plagiarizing a portion of his 2007 master's thesis. After cancelling a string of campaign events and fundraisers this week, Montana Democrat John Walsh announced Thursday that he would drop out of the race for the U.S. Senate. "I am ending my campaign so that I can focus on fulfilling the responsibility entrusted to me as your U.S. senator," Walsh said in a statement. "You deserve someone who will always fight for Montana, and I will." He will serve out the remainder of his Senate term, which expires in Jan. 2015. Walsh, who was appointed to the seat in February, had been trying to regain his footing after a plagiarism scandal. The New York Times first reported that Walsh lifted portions of previously published work in his 2007 master's thesis at the Army War College. The Senate seat is one that Democrats have held in Montana for 100 years — and one that Republicans are heavily targeting as they try to recapture control of the chamber. While Walsh and his campaign contemplated his future this week, Democrats in the state had been working frantically behind the scenes to find another candidate in the event he pulled out. The state's Democratic Party has until Aug. 20 to submit the name of a replacement candidate to the Montana secretary of state, according to the Associated Press. One name that's been floated: former NARAL-Pro Choice America President Nancy Keenan. Originally from the union town of Anaconda, Keenan is a former state legislator who also served as the state's superintendent of public instruction. She lost a bid for Congress in 2000. But that was 14 years ago. "She's going to have to reintroduce herself, and that's going to take a lot of time and a lot of money," says Montana State University political scientist David Parker. Another possibility, the state's popular former Gov. Brian Schweitzer, said Thursday on Twitter that he would not seek the nomination but would "support whoever the next nominee turns out to be." Walsh became the front-runner only after Schweitzer declined to run when Montana's longest-serving senator, Max Baucus, announced his retirement last year. Numerous Montana sources — including many Republicans — said last weekend that Schweitzer was the only person who could get in the race late and stand a chance to beat GOP Rep. Steve Daines. After all, as Parker puts it, even before the plagiarism scandal, this race was a long shot for Democrats. "I would say from the beginning, this was always a tough race, regardless of who they had in there, minus Schweitzer, because this is a midterm election," Parker says. Until dropping out of the race Thursday, one of the last times Walsh spoke publicly about his circumstances was in this interview Sunday, for a story that aired on Morning Edition. "I'm not a quitter," Walsh said, at the state party headquarters in Helena. "I'm going to continue to fight on behalf of the citizens of Montana." According to the most recent poll in the race — the first since the plagiarism scandal — Walsh had only slipped a few percentage points. And the survey, conducted by the GOP firm Vox Populi Polling and released Monday, showed Daines has yet to crack the 50 percent mark, with 18 percent saying they're still undecided.